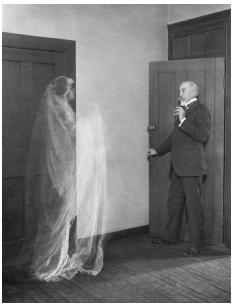 Ghosts, Spirit Contact and Paranormal Activity … Ghostly Dramas Post Roundup! I’ve written a lot of posts (88 so far!) 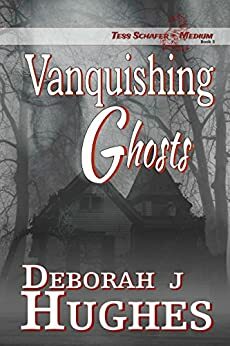 covering a variety of subjects involving paranormal subject matter and there’s some really good ones in among the mix that would help a lot of the people now writing in to me about their ghostly problems, concerns and fears. Although I worry that people will find my answers very repetitious, the answers to similar problems SHOULD be the same! Was I to answer similar questions with a different answer, then I would not be consistent with my beliefs or my advice! I know it’s a lot of work to go prowling through older posts…time is precious and few of us have enough of it! So, I took the time to go through them for you, putting together a “one stop shop” on posts that might be of the most beneficial to the questions I keep receiving! And as to that…I LOVE hearing from you! I do. If I can help in any way…then I will do so. And if you can provide some insight, better yet! When I answer the questions I receive on my blog, I don’t know what I’m going to say until I start typing it. I write what “spirit” moves me to write. This ensures the best possible answer I can give. After all, it’s coming from spirit so how can it be wrong? Now I’m not saying there are no other right answers, but I can only give the one that comes to me. Understand this: ANYTHING we are moved to create…be it a piece of art, a book, a poem, an answer to a question or whatever…ALL of it is inspiration from spirit! Okay. Now back to YOU! The following is a roundup of posts you might find helpful! The above posts contain some of my best advice and most inspired writing! And now I’d like to take some time to speak a word (or two!) about my books (for those who like to read!). My stories are fictional and have all been inspired in a “flash” of inspiration. The story ideas came to me quite suddenly and I went into a mad scramble to get them down in writing. I don’t plan them out (except Rosemary’s Ghosts. Although it came to me in a flash of sudden inspiration, the whole story came to me at once. So, I pretty much know the story before I even started writing it!). My Tess Schafer-Medium series (Be Still, My Love, Hidden Voices, Vanquishing Ghosts and the book I just mentioned, Rosemary’s Ghosts) is centered around…well, Tess Schafer, a 25-year-old medium. Her beliefs and the situations she encounters often reflect my own beliefs and my own encounters! Though works of fiction, they all contain information that involves the spirit world and how to interact/deal with them! 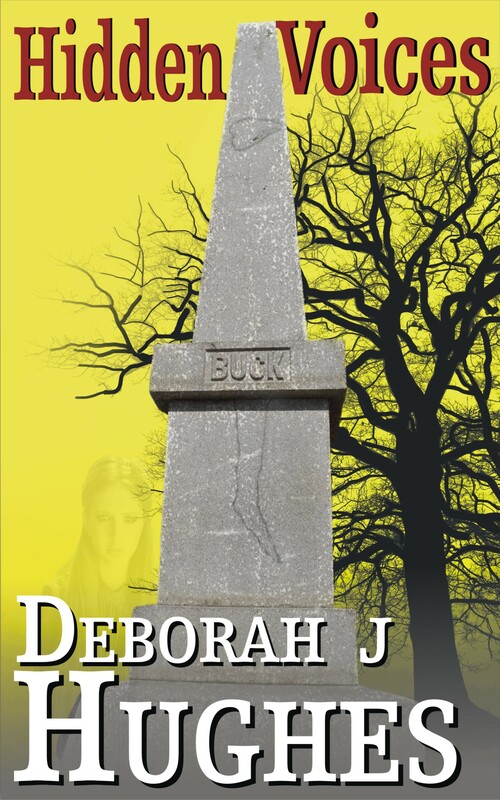 My paranormal thriller, No Matter What is centered around reincarnation. It is a concept I believe in quite firmly. Especially after what I went through with my son. Here’s the link to a post in which I wrote about it “Reincarnation: Fact or Fiction”. 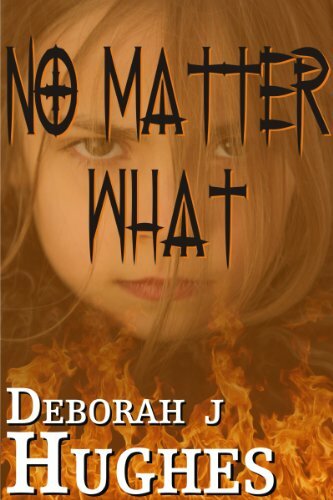 I love all my stories and I thank spirit for the inspiration to write them but “No Matter What” is the one that is most special to me. It’s received some harsh reviews but it would…it’s quite controversial the ideas brought up in the story! Speaking of reviews (left on Amazon), people have complained about my mention of God. 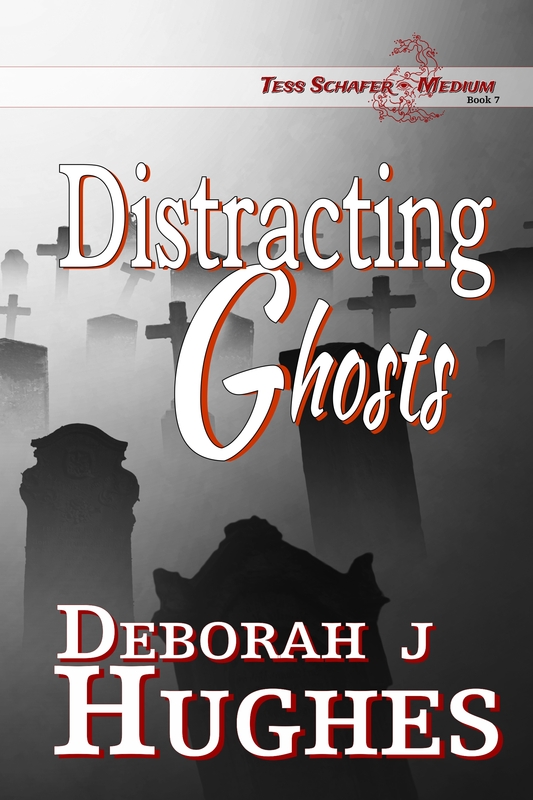 How, I wonder, does one write about the paranormal and NOT bring up the subject of God? Pure horror books certainly. 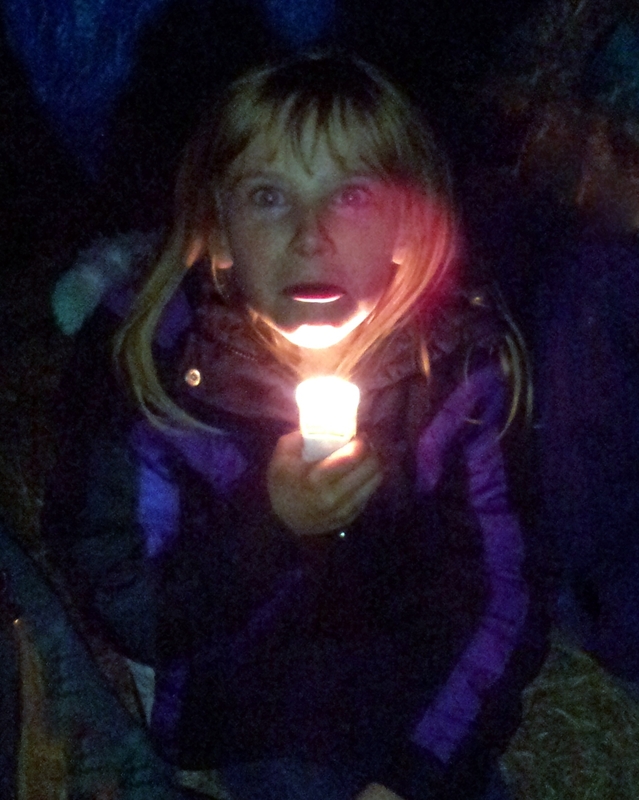 My stories are spooky and have scary elements to them but they are not HORRIFYING. Well, not for most of us. A few of the faint-at-heart have admitted to being scared while reading them! So anyway, yes, my books mention God. Most of my characters (as well as me!) believes in God…a higher power, an infinite intelligence. Someone even suggested that I “leave God out of it” because he had no place in horror books! Personally, I think that’s what going wrong in the world today…people are trying to “leave God out of it”!!!! Bad idea. Bad, bad idea! 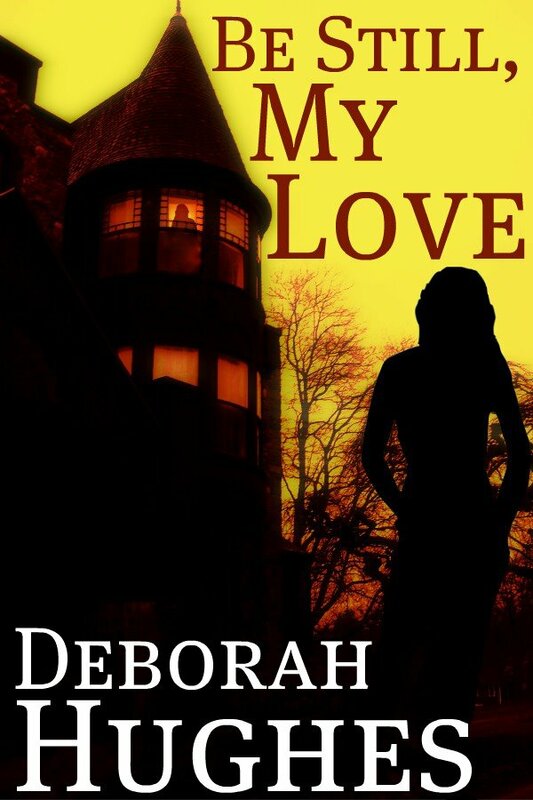 I write the books that I write because there really isn’t any on the market like them. I’m proud to say that. I write the kinds of stories that someone like me would like to read. Because…well, I have to like what I’m writing or I’m not going to write it and it has to hold my interest or I’m not going to FINISH writing it! 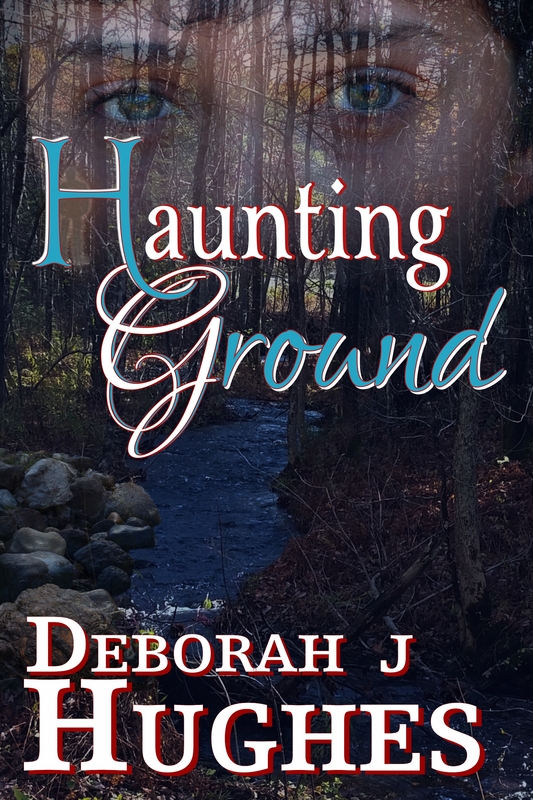 My interest is in the paranormal and so the stories I write are centered around that premise. Also, I’m not going to take God out of my books. So, if you don’t like the mention of beliefs about God, you might not want to read my stories! Or my blog for that matter! 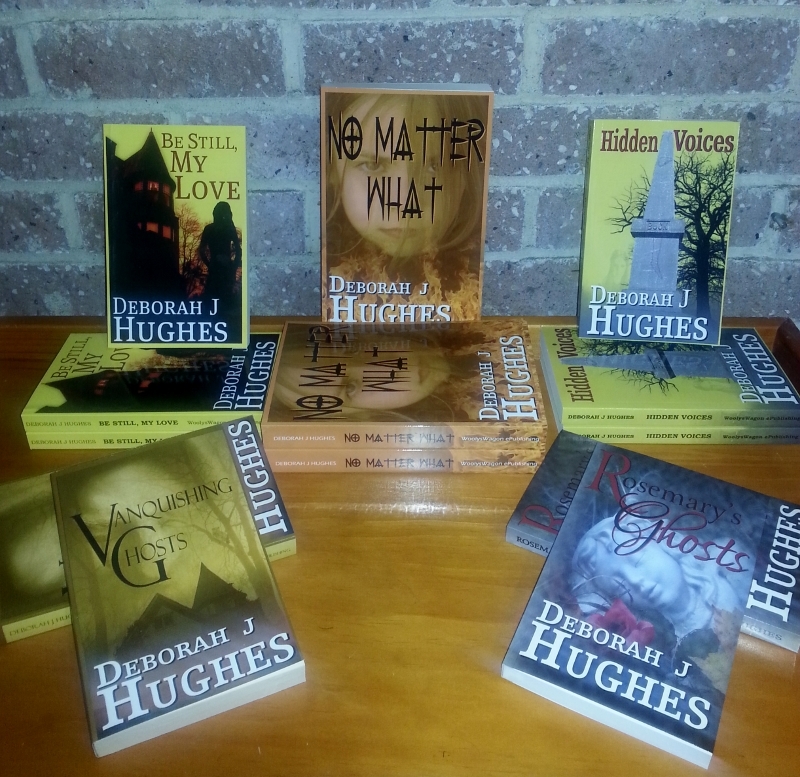 Here’s the link to my author page on Amazon: Deborah J. Hughes Author Page. You can find a list of all my books there (or click on the book cover below!). I’d be happy and honored if you’d check them out! By the way, all but the cover for Be Still, My Love were created by the awesome Anya Kelley! 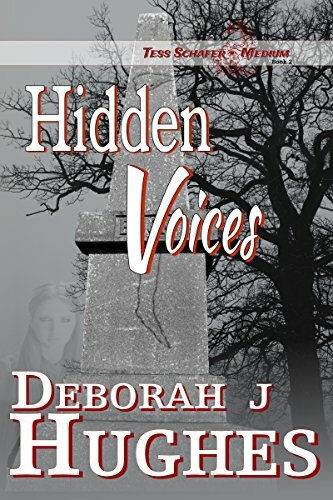 I highly recommend her if you are an author looking for an affordable, talented cover artist! 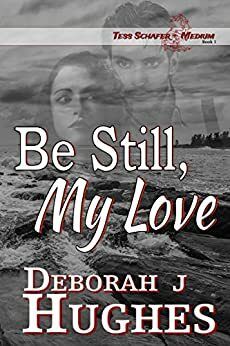 Be Still’s cover was created by the talented Jeff Bennington! 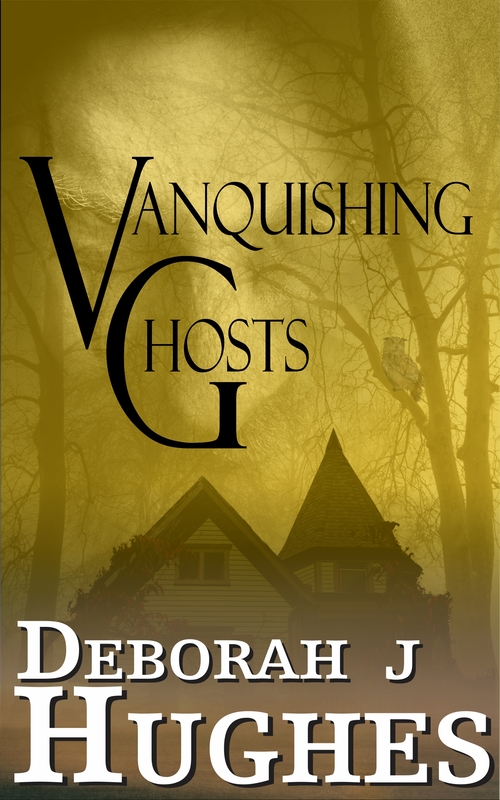 He writes books in the paranormal genre too!! Click on his name and check him out! Okay, that’s it for now! Sending blessings and positive vibrations out to all!! Now is the Time for Talking to Ghosts! The fact is, Halloween evolved from ancient traditions concerning the after life! It’s supposed to be the time of year when the veil between the living and the dead is at its thinnest. Fortune Telling, Divination and Spirit Contact are all more easily done during this very interesting time of year. So, it’s understandable, given that, how the focus has evolved over time to what it is today. Honestly, I am no different. 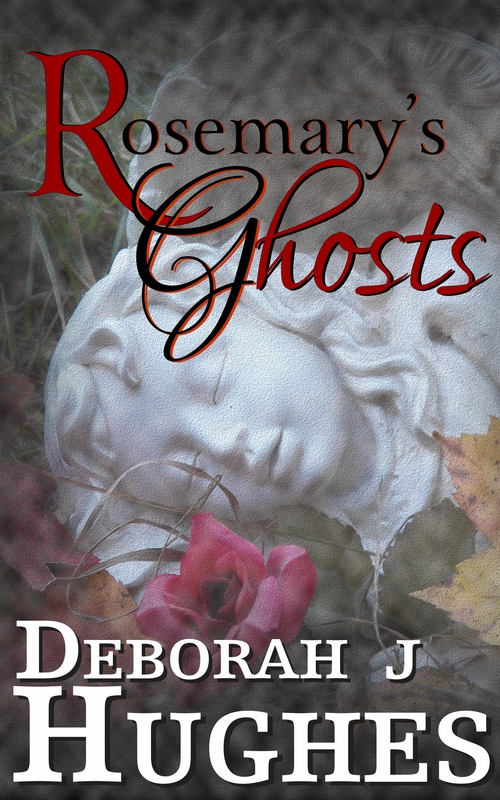 I worked like crazy to get Rosemary’s Ghosts ready for release this month! But truly, it’s the perfect book for Halloween. Even if I have to say so myself. The thing is…my character Tess Schafer, a very gifted medium, understands the relevance of Halloween and that comes through in the story. 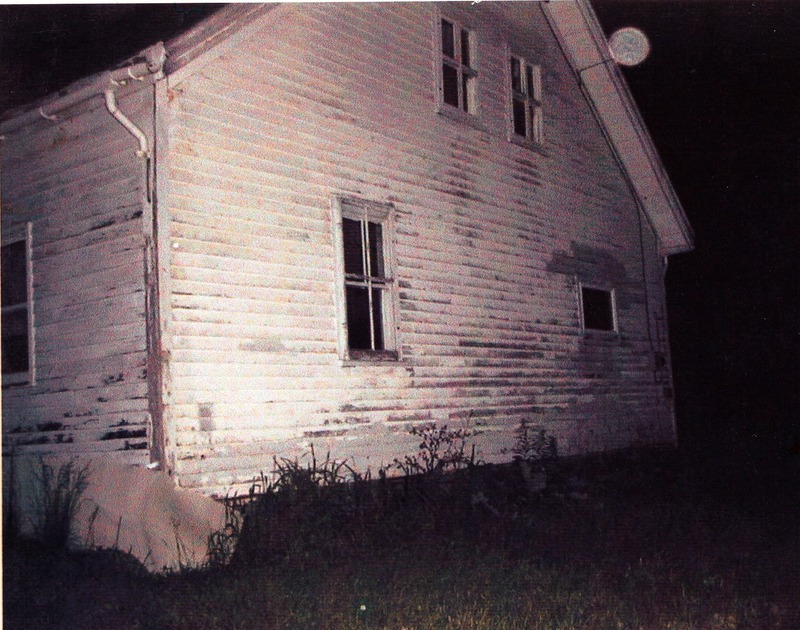 Besides that, I love sharing what I’ve learned about the paranormal through story-telling. 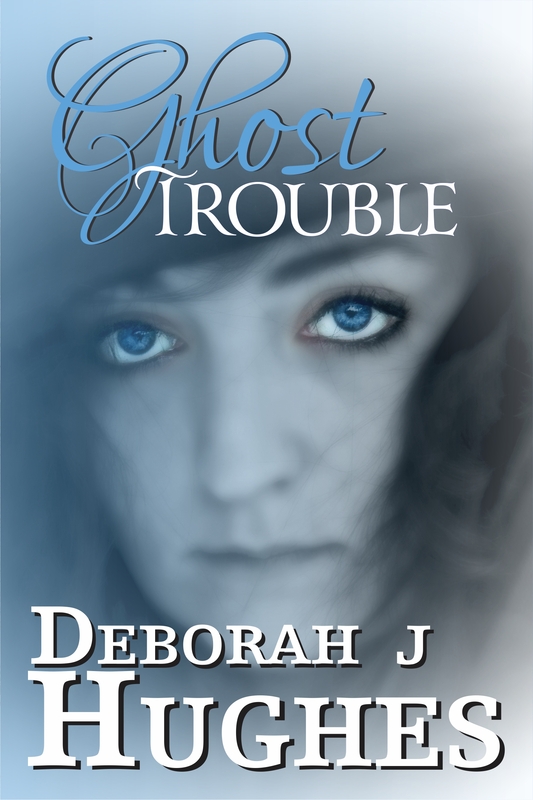 For instance…Tess and Rosemary (a poor, sweet lady being terrorized by ghosts!) have a session of table tipping! Have you ever done any table tipping? Do you know what it is? It isn’t anything like “cow tipping” (which I’ve never done by the way! ), if that’s what came to mind! Most people have heard of the Ouija board I’m sure. The thing about the Ouija is that is acts as a portal to the spirit world. Which is great for those wanting to communicate with spirit, BUT it can bring through all manner of entities. You have to operate it with responsibility and most people who “play” with this so-called “game” don’t understand that! Whenever you seek to interact with “spirit” (the other side), you should know what you are doing and maintain control of the situation. Otherwise, well…who knows what you’ll inadvertently bring through! There are bad, evil entities lurking “over there” just looking for an opportunity to lurk around HERE! But I digress…I want to talk about table tipping. Unlike the Ouija board, tables do not act as portals to spirit. They are simply a “tool” if you will, for talking to spirit. So, table tipping is much safer. One word of caution though…you can still bring through negative entities if you open it up to “whoever wants to come through and talk…please do!” Always make it clear that you want to talk to GOOD, LOVING, POSITIVE spirits. If you get a bad vibe, bad messages and bad behavior…END the session. I’ve had strong “spirited” folks come through but nothing bad. I’m no expert about spirit stuff, but I have my own thoughts about how I think things work and it’s my belief that those in spirit use our personal energy field to make the table move. Since we are here operating within a physical world, our energy is strong (it has to be in order for us to exist here!) and interacts with things of this world quite easily. Spirit, on the other hand, operates within the spirit world and so their energy is different. All energy has movement (vibration) and spirit energy is moving (vibrating) at an incredible rate…much, much faster than the energy that makes up our physical world. That’s why it’s hard to see them (they are moving too fast…think of a fan blade on high speed…can you see it? No!) But it’s not impossible. And that’s a different story. So anyway, by placing your hands flat on the table, resting them there gently, your personal energy becomes connected to the table’s energy and the spirit coming through can easily manipulate it through you. When the table starts moving, you’ll “feel” a different sort of energy and know something is going on! The table will move in such a way that you’ll think someone else at the table is doing it. The good thing about this is that you’ll KNOW for sure it wasn’t you doing it! If everyone at the table is being honest, then rest assured, they aren’t causing the table to move…spirit is doing the work! For some reason, whenever I’m involved in a table-tipping session, I laugh a lot. It’s all good energy and good, positive energy is uplifting, so laughter is fine. In fact, laughter raises your personal energy to a higher degree (increases your vibrational speed) and table-tipping becomes even easier! Singing helps to get the energy going strong as well. 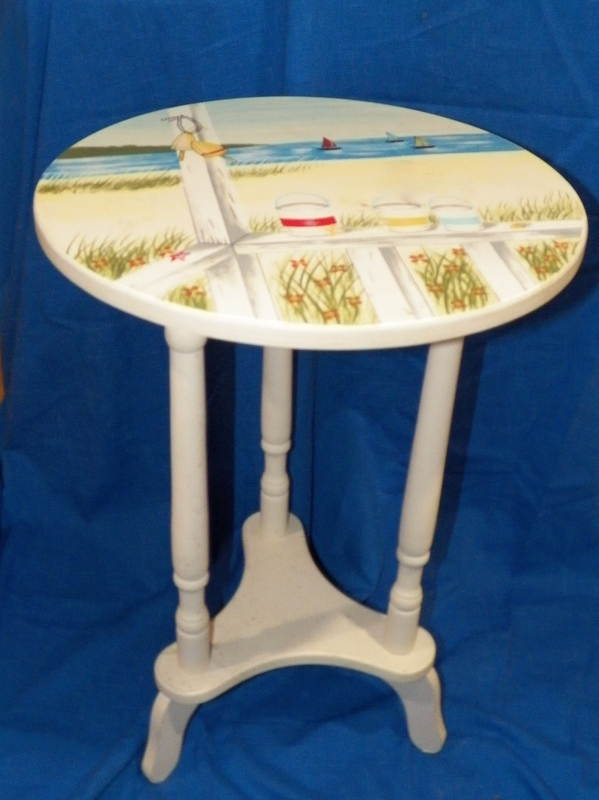 Once the table starts moving…it will shake, shimmy and tip…then take charge of it. State your intentions…whether you want someone specific or not…and make it clear, again, that you will allow only positive spirit energy to come through. Then you set the “rules” for engagement. I do it this way: “We will ask you questions and we want you to tip the table once for yes responses and tip the table twice for no responses.” Now, you can change that around if you want but that’s how I do it. If you want to receive messages then you instruct the spirit to tip the table for each letter of the alphabet, stopping on the letter they want. It’s time consuming to get messages because you have to tip the table for each letter of every word in the message. Sometimes the spirits get so active and impatient that the table tips so fast it becomes confusing what letter they are trying to give! Another thing the table will often do is tip toward someone operating it and rest against them. Gentle efforts to push the table’s legs back down to the floor will meet resistance. I call these moments “hugs”. It’s quite common for a loved one who has come through to give “hugs” and it’s really quite an emotional moment. Honestly, you can “feel” their energy. Sometimes the table will even “walk” across the floor … often heading towards someone not operating the table (they are either trying to let that person know they want to talk to them…or they might be wanting to give a hug!). The thing to remember is to not resist the table’s movements and not to help it either! Most often the case will be that while a table is tipping out a message, the operators will get a strong feel for what the word is…even if only one letter has been completed. This is because the spirit is actually mingling with our energy and their messages will filter right into our thoughts. This is basically how a medium works…they allow spirits to come right on into their thoughts. The thing about those in spirit is they don’t really use WORDS once they cross over. Words are too limiting (and this eliminates all language barriers as well!). They communicate through feelings and so that’s why it’s hard sometimes to understand a message coming through. They are trying to convey a feeling to you and you are trying to put it into specific words. This is also why symbols are often used (for medium or psychic work, and especially in dreams!). 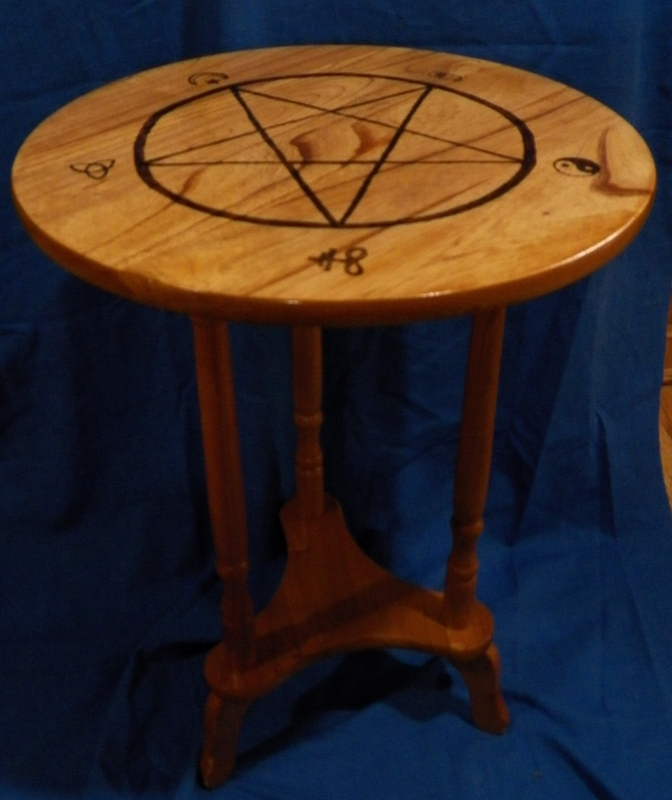 But you don’t have to worry about trying to interpret symbols or anything when you are table-tipping. It’s all good fun, really! There SHOULD be lots of laughter and enjoyment. Interaction with spirit should be a POSITIVE experience. 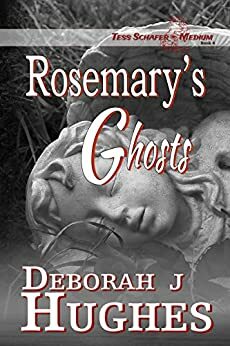 I wrote this post in celebration of the release of my book “Rosemary’s Ghosts” and focused it on table-tipping because my characters have a pretty cool table-tipping session in the story! So, have any of you tried it? Are you going to? Tell us about it!! Until next time, many blessings to all of you and Peace Out!